Former radio presenter Caroline Mutoko has joined the fashion business and will be going against socialites Huddah Monroe and Amber Ray. The 46-year-old has launched a new lipstick line dubbed ‘I AM’ which she teamed up with Pauline Cosmetics to create this product. “It’s for the fierce boss lady who never stopped being a girl, it’s for the lady who still wants to bring style and glamour to the boardroom, it’s for the woman who is still ‘becoming’ and for that super woman who is doing it all but still cares for how she looks,” Caroline said. Price ‘IAM’, which is a limited-edition lipstick, comes in four beautifully designed, packaged and color selection and retails at Sh1,800. Other Kenyans who have lipstick lines include Amber Ray, Huddah Monroe and several other vloggers. 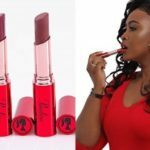 The post Caroline Mutoko to give Huddah a run for her money after launching new lipstick line appeared first on Ghafla! Kenya.